Ace your next project with the utimate belt sanding machines. Now, is it us, or has it just got pretty dusty in here? Sanding may well be one of the most tedious tasks ever invented, if all you have is some paper and a sanding block. But like many things in life, it gets a whole lot more fun when power tools are involved. Whether you’re doing up old furniture, preparing decking boards for staining or removing horrible varnish from hardwood flooring, a belt sander can make short work of even the biggest tasks. In some cases you might even get away without having to hire an industrial model at great expense. What makes the best belt sander? Power always helps if you’re tackling really tough jobs, but sometimes a small sanding area is a bonus if you plan to do more detailed work. A sander that can be mounted to a workbench is a boon for keen woodworkers, and the ability to attach a vacuum cleaner is a big help for indoor jobs. Don’t just look at the sticker price (or pay the RRP: sanders are often discounted massively, especially if a newer model is coming up): check the cost and availability of the sanding belts too. You’ll be going through a lot of them. We think these are the best bets for most jobs, and budgets. This typically well thought out device from Bosch is designed to be used however you like: upside down, against walls, on the ground… it’s happy whatever you want it to do. Automatic belt tightening and alignment keep everything shipshape, the 710W motor has enough grunt for the most demanding jobs and the low vibration system does its best to minimise the tingly fingers you’ll get from protracted sanding. The dust catcher isn’t much cop unless you’re sanding really small things, so eye and dust protection is a must. You can get belt sanders for a lot less than this, but Bosch tools reliably fit the big niche between 'cheap as chips but prone to self-destructing' and 'pro-grade monster tool'. That's true here. Amazon’s current best-selling belt sander has an RRP of £78, but Amazon’s doing it for just over half that amount. At that price it’s good value: you wouldn’t use it in place of an industrial sander to file down a whole house’s floorboards, but for everyday jobs it’s perfectly capable. As with most sanders the supplied dust bag is pretty hopeless - goggles and a mask are essential for any indoor jobs - but the 720W motor is powerful, the automatic belt tracking means you don’t need to worry about keeping the belt lined up properly and the fast change system makes the tedium of belt swapping a little less tedious. At £80 we’d look at alternatives, but for under £50 this Black and Decker is hard to beat. The table-mounted sander is one for anyone who needs a larger and more complex sanding surface when working with tricky shapes and curves, as the variety of rubber drum sizes makes it simple to match the shape and size of the piece of wood with the correct tool. An oscillating action that moves the drum up and down during rotation reduces static friction that can cause burning and unsightly marking. It also extends the life of the sanding sleeve by spreading the wear across a broader surface, meaning you won't be popping to the shops every five minutes to buy replacements. Not ideal for removing old varnish from a wooden floor (unless you take up each individual piece and run it through the machine), this worktop-mounted sander is aimed at those woodworking professionals with intricate projects. Chances are, if you’ve hired pros to do any work on your house they’ll have had Makita tools. They’re famously reliable and fantastically expensive, but Amazon is currently offering this model for just over half the RRP. It’s at the high end of DIY tools and makes light work of even big jobs thanks to a large sanding area and a powerful 1010W motor. The dust bag actually works and the sander feels like it’ll last forever, but beware: it’s a heavy beast at 4.7kg, so it’s not something you’re going to want to use vertically for long periods. But for bigger domestic jobs such as tackling old flooring, the weight and power means it’ll cope much better than lower-powered, lighter sanders will. As entry-level belt sanders go, it's very difficult to beat this extremely affordable model from Guild. Granted, it does lack the advanced features of the more expensive models but it tackles the task in hand with minimal fuss. In fact, I was pretty impressed by how quiet the unit was when sanding a few old floorboards. The adjustable belt tracking system is a bit fiddly and finding the correct width sanding belt can be tough but it does feature a small bag that attempts to get rid of the worst of the dust. Not without it foibles, this Guild model is easily bettered in a head-to-head test with the likes of Bosch and Makita but given that it costs about the same as a sandwich and flat white in London, it's hard to fault. A good, no-nonsense option for those seeking quick and cheap sanding. 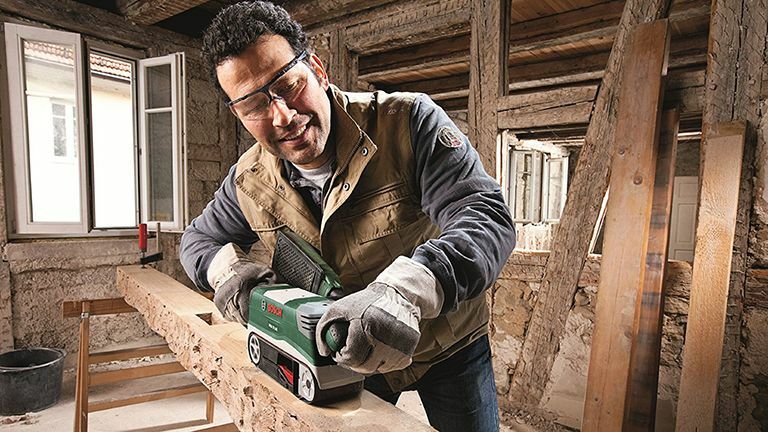 What if you have a Makita-sized job but don’t have a Makita-sized budget for your power tools? At 650W the Skil doesn’t have the Makita’s sheer power, but while the moulded body feels a little plasticky the device itself is solidly built with a decent spec and a good-sized sanding area. Its equaliser frame ensures consistent pressure across the entire sanding area, the belt is auto-aligned and the belt changing mechanism is quick and simple. There’s a vacuum adapter to keep the dust to a minimum but we’d still recommend goggles and face masks for indoor jobs. Customer reviews are unanimous: it’s cheap but cheerful and solidly made, and at 3.6kg it’s a little lighter than many sanders. The sanders we’ve highlighted so far are pretty big and ideal for sanding doors, worktops, floors, beams and anything else where size matters. But not all jobs need such broad brush strokes: some furniture is made largely of nooks and corners, and some spaces are too small for even the slimmest standard belt sander: good luck doing window frames in situ. That’s where the Powerfile comes in, with its 13mm belt that can get into the tightest spaces. It can take a 6mm file too, although that isn’t included. There’s no vacuum adapter, presumably because Black and Decker assumes you’ll be using it for small jobs, and while the 350W motor doesn’t seem very powerful on paper it’s more than adequate for sanding and shaping wood and metal.